This dress made my figure look amazing very slim and a great shape. Everyone loved my dress and thought it looked really expensive. <br><br>I paid $2900 but am selling it for $1300. I am 162cm tall and I wore very high platforms on the day.<br><br>Stunning Roz La Kelin dress!!!!! !<br>Ivory satin dress with swarovski beading and motive in centre. 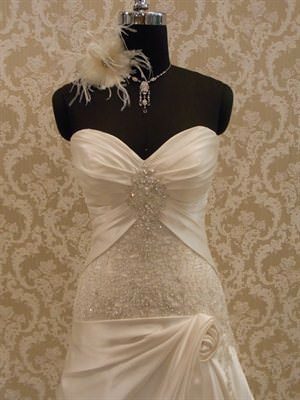 Sweetheart neckline and beautiful satin wrapping on left hip. The lace up back allows you to cater for your changing size and the bow tucks in. It has a beautiful train that bustles up.<br><br>My wedding was in January 2012 and the dress is as new. The dress was professionally hand dry cleaned by Syndal Bridal Dry Cleaners (for $300 certificate available. )<br>Worn once only.<br>This is not a professional photo as I haven't got these yet but the proof photos are really beautiful.<br><br>Feel free to leave a message if you can't get through and I'll call you back.